Dear readers, the ponies and I are still alive and very much kicking. Life happened a little and got in the way of blogging, but thankfully not much in the way of riding, and the horses and I are still plugging happily onwards. You all know the standard excuses for not blogging by now; today I’m playing the “I was studying” card. Cambridge IGSCE, for the record, is not for the fainthearted. Thanks be to God, I’m still homeschooled, so there’s still plenty of time left over for riding. I started off the week by bringing Arwen back into work. 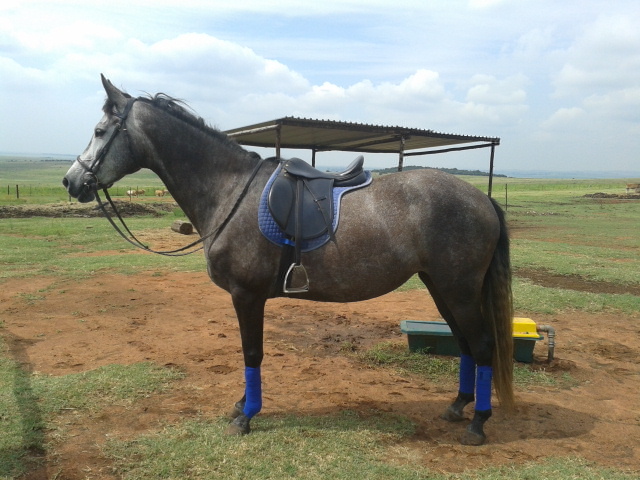 Having taken six weeks after her vaccine off but for the odd hack – if ridden too hard straight after having an African horse sickness vaccine, a horse could potentially contract the virus from the vaccine – Arwen has luckily stayed slim. There is a bit of a hay belly popping out there, but nothing that a few weeks’ work won’t fix. Her muscle tone and condition is still fine, so we’ve gotten off almost scot-free. With three weeks to go before our dressage show it was time for Arwen’s holiday to end. I brought her in on Monday for my lesson and the Mutterer marked out a 60 x 20m rectangle in the middle of the big grass area I use for an arena. Our dressage letters being anonymous tyres, this makes for a little confusion (“Working trot to B” “Which one’s B?”), but after sniggering at some quite interesting mnemonics I seem to be getting the hang of them. The actual dressage is relatively easy. We’re only doing Preliminary 1 and 2, which are the lowest of the low. About the hardest thing we do is lengthening the reins at the trot, and Arwen stretches beautifully, so even that isn’t too bad. I rode her in spurs and side reins this week. Arwie has never been the responsive sort and I always carry a whip or spurs when I’m riding her; usually a whip, but spurs actually work a whole lot better. For one thing, they are wonderful for lateral work. There’s a reason why even the most responsive horses in advanced dressage are ridden with spurs. They give you much more accuracy and subtlety with your aids. 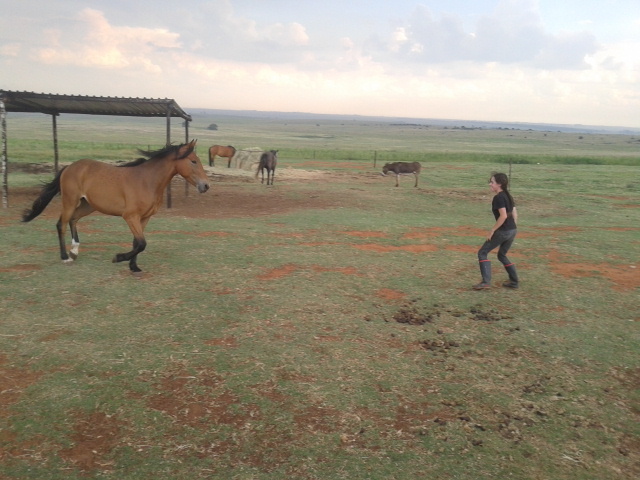 Arwen’s leg-yield and shoulder-in in trot were virtually nonexistent, but with a pair of spurs she’s quite brilliant. The side reins were just to help her go in a better frame instead of doing the whole pony nose-out thing. I rode her in them three times and yesterday just warmed up with them and took them off to practice the tests themselves and she went beautifully, just as if they were still on. Most of her work is pretty awesome; she’s forward, responsive, balanced and makes stunning transitions. Even her halts are getting nice and square. The one issue we’re having at the moment is her canter and canter transitions, which is really weird, because Arwen used to have an awesome canter and perfect transitions. I’m guessing she’s a bit rusty after her time off, so we’ll be cantering all week and see how it goes. She does canter and she gets us around the track okay, but she doesn’t strike off on the right lead properly and once even flopped back into a trot, which will destroy our dressage score. Thunder has been pretty awesome; I schooled him on Monday under the Mutterer’s watchful eye (this time with a new cinch 😛 ) and even the Mutterer was forced to concede that he’s quite nice. Thunder’s jog is very good and his lope is coming along as well. He went on the correct lead all of the time, didn’t rush as much, and didn’t fall out with the shoulder in his circles as much as he usually does. We even had a good gallop and then a halt from a gallop, not entirely a sliding stop, but heading that way. The trouble is that he still doesn’t neck rein. 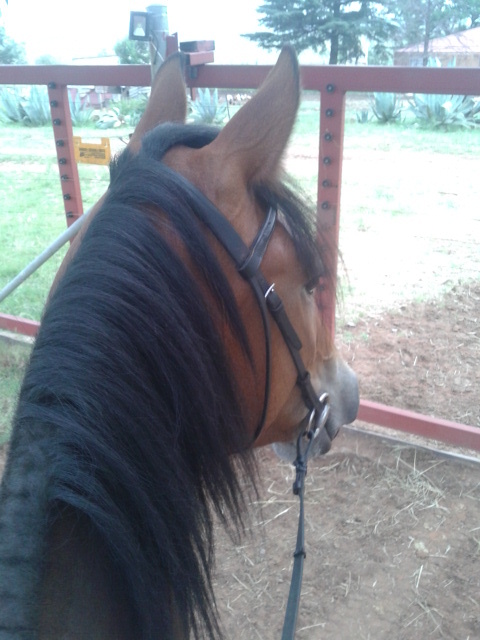 I only need one hand on the reins most of the time, but I still have to tug on his mouth, which is annoying. It took Skye months to learn this, though, so I’m prepared to be patient. On Wednesday we went for a short hack and he disappointed me a little by being really spooky. It could be to do with the fact that we went past the same place where I came off last week, an unnerving experience for both of us. Or he was just having one of his daft days. Either way, he didn’t bolt or shy seriously; he was just tense and jumpy. He gave me two nice relaxed lopes, but balked at one point on the way home because he saw some mysterious scary object undetectable to human senses. We got home in one piece, he repeated the perfect gate-opening of last week, and there were no serious issues, so no harm done. Reed was a little on the lazy side this week; maybe he needs a bit of a break from routine. We had a quick schooling session on Tuesday and I was hoping to get his first flying change or two, but although his simple changes were absolutely foot perfect, no flying change in sight. I introduced a little shoulder-in in walk. He wasn’t brilliant, especially to the left (he’s a touch stiff on that side), but something I found rather interesting was how much better he went after the shoulder-in. I’ve noticed it with Arwen, as well; after a little lateral work in walk, even if it is just 20m of shoulder-in or a couple of steps of leg-yield, they suddenly get supple. They arch their necks, step under themselves and get forward, obedient, and soft all along their bodies. I’m not sure exactly why this is – maybe the lateral movement loosens them up and stretches their muscles – but I’m definitely incorporating some gentle lateral work into my warm-ups. I challenged Reed on Thursday by putting up a 90cm vertical with a close ground line straight away. Usually I pop him over a cross-rail or two before getting down to serious jumping, and he evidently wasn’t impressed with the new arrangement; he stopped a few times before actually jumping, and seemed kind of hesitant and perturbed once he actually jumped. Something to work on and for him to get used to. I stuck it out with him and didn’t let him get away with it, and when he was jumping rhythmically I changed the vertical into a quite wide oxer with about a 60cm cross-rail in front and the 90cm bar behind. Again he stopped once or twice before jumping, but once he jumped it, he was fine. We cleared it a few more times before I changed the cross-rail in front to a 70cm vertical. This looked much more formidable and I know how much Reed hates verticals, but he was really amazing, didn’t even look at it and cleared it at our first leap. On that high note, I ended the session. The owner of EJ Quarter Horses and Paints was around to take awesome photos, too. This must be the best photo of me riding over jumps I have yet. I seem to be riding a whole lot better than in previous jumping shots: I’m focusing ahead of us (although not quite between his ears), and my hands are following his head a lot better. Looks like I am sort of sticking to my New Year’s resolution. Tuesday was madness; I had a bunch of horses to work and, while it was a lot of fun, I didn’t have a lot of time to spend on each horse. Titan was a bit of a pain to lead in; he was excited about the three mares on heat around the arena and pranced around accordingly. Once I was on him, he kept prancing for the first five minutes or so, but settled down nicely, and by the end of the session he was giving me the best canter work I’ve ever had from him. To the left his canter was absolutely stunning, slow, calm, balanced; he even gave me some really nice circles. To the right he is still a little unbalanced and tends to rush, and his circles were wonky, but no bucking, tearing off or any nonsense. I was impressed. 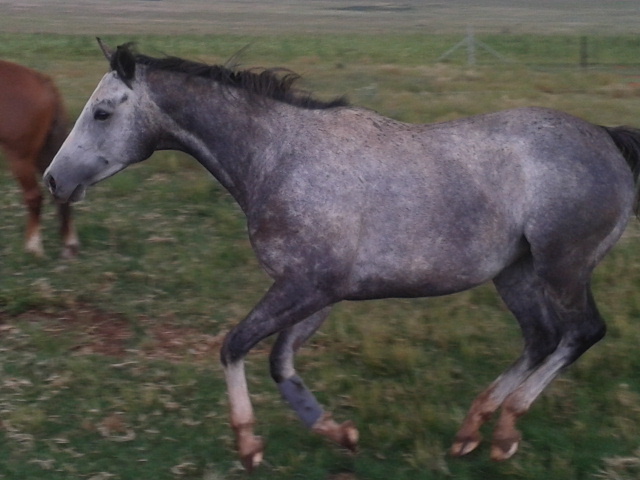 Then I was back on a little grey Nooitgedachter crossbred I used to school last year. 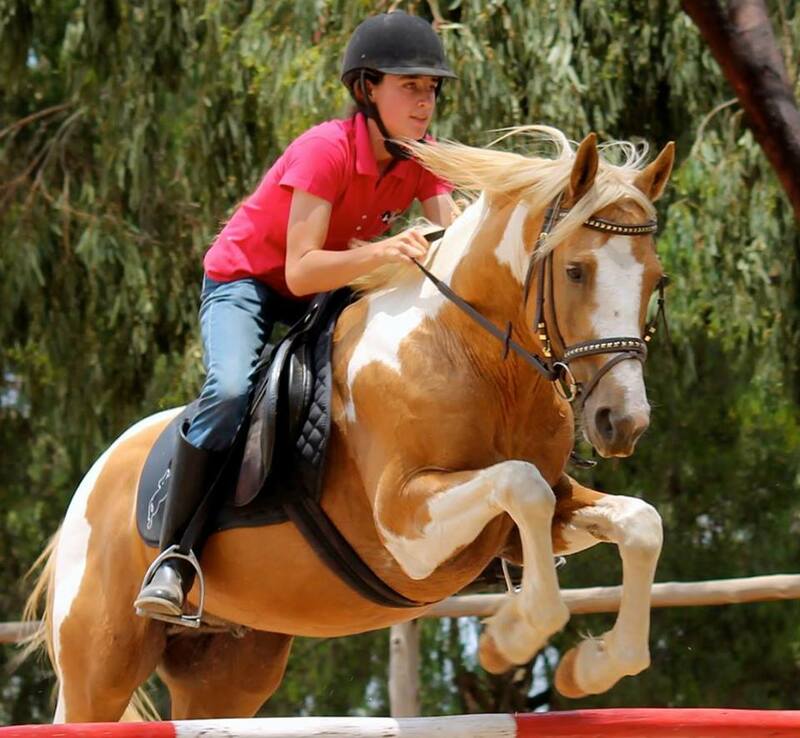 Tina is about 14.3hh and very adorable. An old hip injury has made her rather stiff and she doesn’t like to canter on the left lead, but she has a beautiful soft mouth and comfortable movement. As she’s a child’s pony, this and her good temper matters most. Sunshine was my next project; a new little filly I haven’t worked before. She’s not really backed, so I just lunged her, but she was responsive and clearly knew what she was doing. She’s pretty and a comfortable size for me, so I enjoyed her. Last but certainly not least is dear little Chrome. On Thursday, dear little Chrome decided to show me that he can buck after all, and buck he did. He was not in the mood for loping, especially not to the right, and he even did a handstand or two before settling down to his nice easy lope. He is young and very green and can be excused for having the odd daft day; they can’t be born knowing exactly how to be ridden, even though Chrome usually seems that way. Silly adorable golden retriever. Sore leg? What sore leg? Magic and Skye both had the week off; Magic because his wound is not quite healed (and evidently itches, judging by how often he removes his bandages and turns up with blood all over his nose), and Skye because her poor tender fussy feet are bruised. The Mutterer will trim and treat them on Monday, and she’s not lame in the paddock, but I don’t want to make it worse and cause abscesses or something similarly horrible. She is most unimpressed with me and she and Magic are getting really annoying; the arena is in their paddock, so they like to follow the horse I’m working and gallop around like idiots just to show me how perfectly sound and rideable they are. Beautiful horses. Long may you remain happy and healthy, you most exquisite and noble of all God’s beasts. I’ve had no internet access for 5 days (tragic!!!) so I’m just reading this now. I just love reading about your babies, Firn. They are gorgeous as always 🙂 I’m glad to see Pepper has a teddy bear. 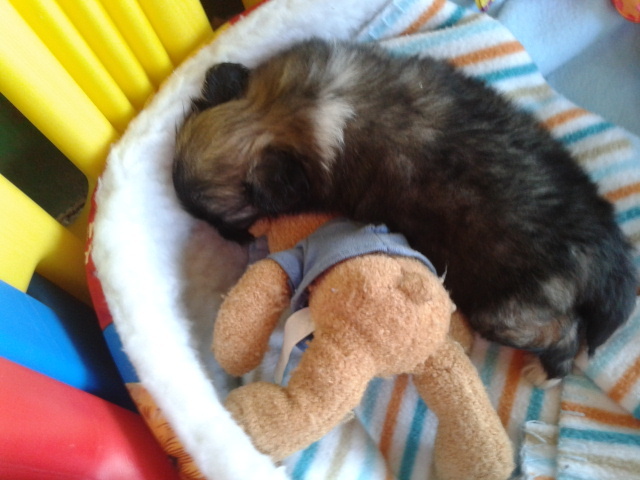 My little Cavoodle has several teddy bears, and a multicoloured rabbit, which she carries everywhere with her. Oh my!! Glad you got it back! Yes, little Pepper loves her teddy. So cute!